A Sla.ckers.org forum member, LeverOne, posted ways to access HttpOnly cookie through the use of Java API and applet. I reproduced his techniques. When the first method was tried, the Java Runtime did not allow the HTTP TRACE method any more. It threw an error message, "uncaught exception: java.security.AccessControlException: access denied ("java.net.NetPermission" "allowHttpTrace")". When the second one was tried, the Java API, getRequestProperty("Cookie"), return "null" value. It seemed that we cannot read the browser cookie storage from Java applet though it can connect to the requested URL with browser cookie. Subsequently, the HttpOnly cookie was forgotten by the security community. It was talked about and has been used as a security measure based on 1740K results from Google, including the OWASP. As far as I have researched and tested, I could not find ways to gain access to an HttpOnly cookie that has already been used by browser. I then thought of reading set-cookie response header containing HttpOnly cookie. Reading it through XMLHttpRequest was fixed. When I looked at Microsoft Silverlight, it seems that security considerations were taken into account in its design in HttpRequest and HttpResponse handling. Silverlight separates the Http handling by Browser-based and Client-based. I can gain access to the set-cookie response header only if I use the latter one. Even so, this is applicable only for the set-cookie response header that does not have "HttpOnly" attribute. In addition, the Client-based cookie storage is isolated from the browser-based one. Reading it through Adobe Flash/ActionScript seems possible for Adobe AIR and Flash Lite 4 based on the Adobe documentation. Then left is Java. Looking through Java Http API, I found an interesting method, getHeaderField, under java.net.URLConnection package. I quickly wrote an applet that requests a URL and reads its response set-cookie response header using getHeaderField method. To my surprise, it works! Why this can be an issue with Java itself, a vulnerable page in a real-world application may have already issued the HttpOnly cookie by the time the script has executed. However, there are certain circumstances that lead us to compromise HttpOnly session cookie. 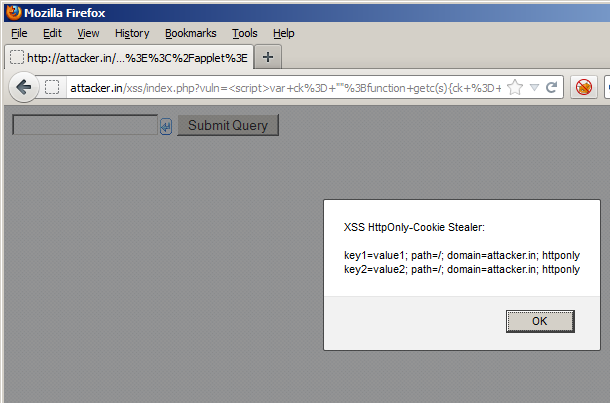 Let's say, we find an XSS issue in unauthenticated page, welcome.php. 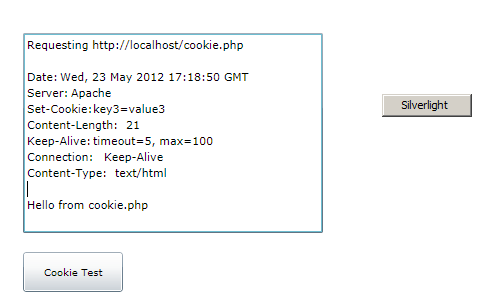 A victim has not accessed the login page, login.php, which issues an HttpOnly session cookie. The application does not renew new sesession cookie after user logs in, which is vulnerable to Session Fixation attack. In this case, we entice the victim to execute our HttpOnly cookie stealer XSS payload on the welcome.php page and make the payload send the stolen cookie to us. According to the provided scenario, the exploit will not work if the victim has already accessed the login.php page. This is not always the case. For example, many web applications have a logout page whose job is to clear session data and to issue either new session cookie or empty session session cookie such as PHPSESSID=deleted. Here, our XSS payload will call this logout page first and then call the login page which issues HttpOnly session cookie. You can create your own one that sets httponly cookie.